I have actually reviewed this product before but the reason why I'm writing a new review for this is that it has since had a name change. I originally received this as a sample from Escentual when it was the Soothing Hydrating serum and I really enjoyed using it. I recently decided to purchase this and had a little panic when I couldn't find it anywhere. A quick tweet to Avène revealed this had been changed to the Hydrance Optimale Hydrating serum, possibly to fall in line with the Hydrance Optimale line. 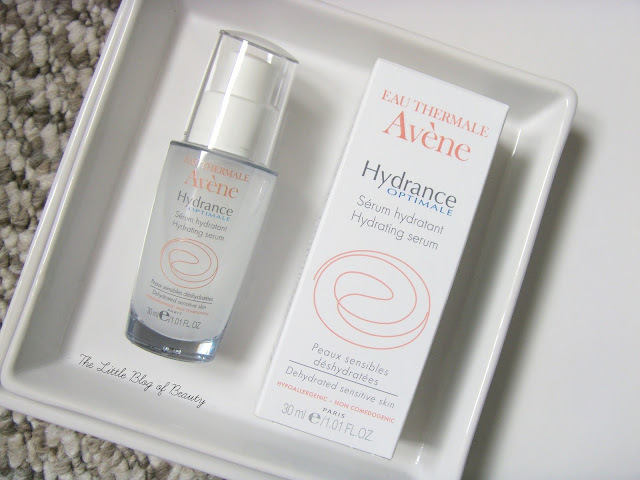 The Avène Hydrance Optimale Hydrating serum is for dehydrated, sensitive skin, making it perfect for my skin. It relieves tightness, sensations of discomfort and fine lines caused by dehydration. It contains Avène thermal spring water for optimal hydration and intense soothing. As you're probably aware if you've been with my blog for a while I suffer from very dry/dehydrated skin that struggles to absorb heavy products and much prefers lighter gel type formulas and serums. I've only started using serums in the last couple of years, in fact I've only used any kind of skincare in around the last four years, and I've discovered serums are ideal for my skin. Serums are absorbed deeper into the skin than moisturisers so they help to keep my dehydrated skin hydrated for longer. As a serum this is very light and easily absorbed into the skin. It feels really cooling and soothing on application and disappears almost instantly leaving behind soft, smooth skin. I suffer with redness across my cheeks and this helps to visibly reduce this, which is exactly what you want before applying makeup. Depending on the weather and how dry my skin is at the time this is often enough for my skin in the morning in the summer if I'm in a bit of a rush, but I currently like to team it with The Body Shop's Vitamin C Glow boosting moisturiser. I was concerned that the bottle looks a little tiddly for £17 (it contains 30ml) and that I would get through it very quickly but one pump is enough for my whole face and so far it's lasting reasonably well. The popular Vichy Aqualia Thermal serum (which I've got my eye on next!) is £22.50 for the same amount, so this is over £5 cheaper. The Avène Hydrance Optimale Hydrating serum is available on Escentual and in Boots stores. Are you a fan of using serums? I'm new to the whole serums thing but they sound so good for your skin, I'll have to give them a go!